I've never slipped so often in these soles and can't recommend them or "in river" use. They came with my boots and I called Korkers and was told that I should just use other soles. I wish you had an option to get something else. Boots are awesome otherwise. I've had other pairs of boots (non Korkers) resoled in the past, and I promise that the process was nowhere near as satisfying (or done as quickly) as attaching these Kling-On Sticky Soles to my Korker Boots. The first pair of these soles lasted a few hundred kilometres of amphibious hiking through the course of a field season. The second pair made it through the following hunting season and then the next field season. Great soles on great boots, and the quick removal and non-porous surfaces means that sanitation to remove both terrestrial and aquatic invasive species is very easily done. Perfect for day to day use but you definitely want a different sole for river fishing. These soles are seemingly frictionless in the presence of water... I've begun to use these soles to hike in in order to preserve the incredible Vibram Idrogrip wading soles... the difference is night and day between these. 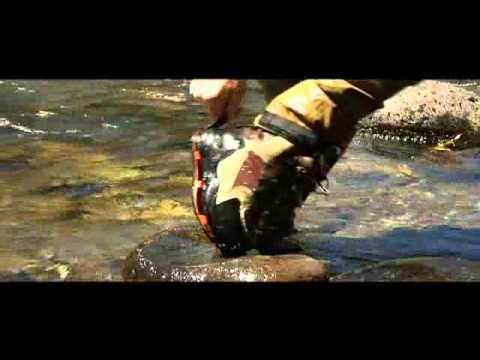 These soles are "Sticky" for walking out to, but not into the river. I swap them off for the felts which have worked great in the water so far. I've been pleased and like being able to swap soles as needed. So far they've held up very well. Great on land, Slick in the water! Used these for a week in Alaska and they are the slickest soles I have ever worn. I could not use felt in Alaska nor my home waters. Would like to try the studded but concerned they will be slick as well. My Boots are the best fitting I have ever owned, but the soles make them a challenge in the water.